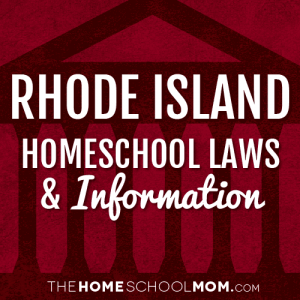 Use the secondary navigation menu above to quickly make your way to pages for Rhode Island state organizations, local homeschool groups, classes, co-ops, field trips, and more. Chapter 16-22: Curriculum 16-22-4 Instruction in health and physical education. From the State of Rhode Island General Assembly. Chapter 16-22: Curriculum 16-22-2 Civics education. Chapter 16-19: Compulsory Attendance 16-19-1 Attendance required. Chapter 16-19: Compulsory Attendance 16-19-2 Approval of private schools – Requirements – Review.